Race day, tailgate parties, festivals and celebrations – your choices are unlimited. This truly unique beer bottle crate gift holds all the trimmings for a good time! 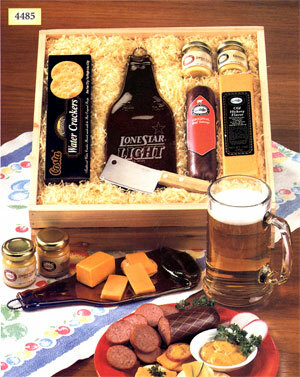 The unfinished wooden crate holds Old Hickory Cheddar Cheese, Original Beef Sausage, mustards, crackers, and a flattened beer bottle cutting or serving piece. A cleaver is included. Shipping weight: 4 lbs. Measures 12” x 12” x 3 3/4”. Case pack: 4. Prices shown per piece. Engraving area: 3” x 2 1/2”. This flattened beer bottle can be laser engraved with your logo for an unusual presentation gift. The beer bottle plate comes in a protective box. Mailers are not included. Order in complete case packs. Shipping weight: 12 lbs./case. Measures 9 7/8” x 3 1/2” x 1/2”. Case pack: 12. Prices shown per piece. Engraving area: 3” x 2 1/2”. 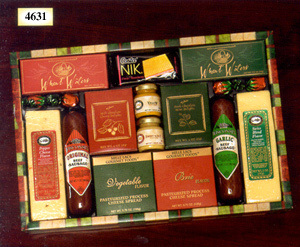 Everyone can choose their treats from our cheeses and cheese spreads, sausages, crackers, mustards, crème wafers, chocolates, and fruit hard candies. Shipping weight: 5 lbs. 16” x 11” x 2”. Case pack: 6. Prices shown per piece. Lucky seven line-up of cheese and sausage favorites makes party plans come true. 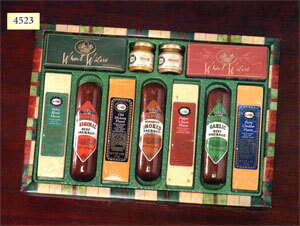 This premiere collection contains four cheeses and three sausages, plus crackers and mustard. Shipping weight: 5 lbs. 16” x 11” x 2”. Case pack: 6. Prices shown per piece.